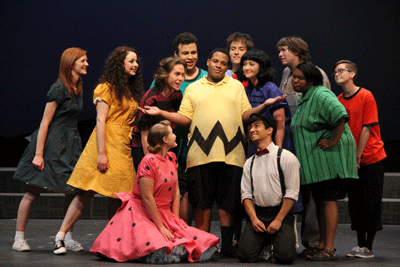 The Cowley College Visual & Performing Arts Department gave four show stopping performances of “You’re a Good Man, Charlie Brown” based on the comic strip “Peanuts” by Charles M. Schulz, November 5-7 in the Robert Brown Theatre. The fall musical was directed by John Sefel and had musical direction from Marcia Wieland. Milan Anich II handled the set and lighting design. “I was proud of the work of Marcia and Milan in their first show as part of the team at Cowley,” Sefel said. Cowley sophomore Semaj Smith made his on-stage debut as Charlie Brown, while freshman Michael Rodriguez made his theatre debut as Snoopy. Several other freshmen made their theatre debuts at Cowley a memorable one for themselves and the audience. “It was a delight to see so many folks of all ages come and enjoy the show,” Sefel said. The evening performances had a special musical preshow featuring Cowley College jazz musicians and vocalist Monica Morris, while Thursday’s performance was tied in with the Cowley College Foundation dinner. The Cowley College Visual & Performing Arts Department will now begin preparing for spring productions of “The Diary of Anne Frank”, March 3-5, and “A Midsummer Night’s Dream, April 21-23. The Woodstock Wockettes – Hannah Coryea, Kayla Hawkins, Riley Paye, Hannah Short, and Courtney Wallace.